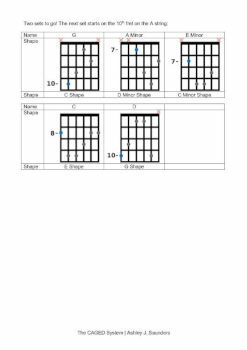 The guitar CAGED system is a fundamental building block of playing guitar. It's the base which enables you to become a solid guitarist. If you've haven't heard of CAGED before or have tried it and didn't understand much then this eBook will explain what the system is and how to use it, step by step. While most guitarists used to get started with the blues, today most start with the CAGED system. 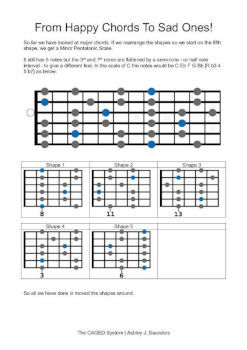 The reason why is simple, this system is a fundamental building block of guitar playing. So if you want to become a great guitarist, then you will want to master and apply the CAGED system. In the CAGED System eBook, we will explore all the major components and how it all fits together. If you have never studied the system before, don't worry the eBook is easy to follow and will take you through the system, step by step. If you have some ideas about CAGED then your knowledge will be enhanced and solidified. At the heart of the guitar CAGED system is a scale which expands across the fretboard. We can then place guitar chords on top of this scales. 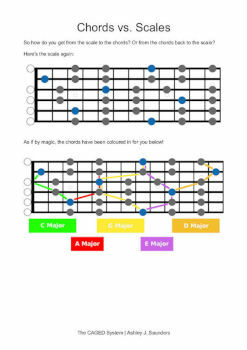 So and we can match scale shapes to chords. This enables us to build any chord, anywhere on the fretboard. By being able to build chord across the whole fretboard, you longer need to feel trapped or have to skate up and down the neck. While it's worth understanding how the system works, it's also a good idea to learn how to find other related guitar chords. And so, this ebook covers this as well. 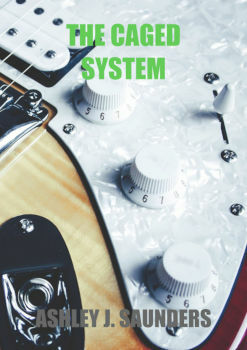 If you need a practical explanation of the CAGED System and how to use it to improve your guitar playing then this eBook for you!